Perennial-A flowering perennial is a non-woody plant that dies to the ground each fall and comes up again each spring. In contrast, an annual plant lives for only one growing season and a new one has to be planted each spring. Where should Perennials be used? Perennials can be used in flower beds with evergreens and shrubs, as borders, ground covers, color accents, or to add texture to your landscape design. The accent color may be a single plant, such as a peony, or a mass planting of daylilies. Perennials also make good cut flowers, both fresh and dried, for the home. First consider the amount of light that the plants will receive and then check the area for the type of soil and drainage. Most perennials prefer a well-drained site, but there are types that will tolerate poorly drained soils as well as dry soils. Elevating the bed can improve the drainage. 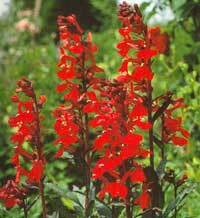 Another point to consider is the mature height and width of the perennial. Tag should specify this information. Although many planting areas fall in the range of part sun to part shade, some perennials require full sun or full shade to reach their potential. Don't rule out a plant that you like just because the conditions are not exact. Try experimenting a little bit. Full Sun - An area that receives at least 6 hours of direct sunlight - including 4 hours in the afternoon. Full Shade - An area exposed to direct sun for less than 4 hours per day. How far apart should perennials be planted? 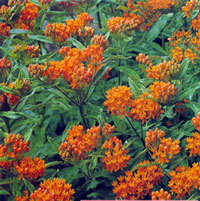 Most perennials can be planted 12 to 15 inches apart. However, planting them 18 to 24 inches apart will provide better air circulation and keep the larger plants from shading the smaller ones. What is dead-heading and what does it do? Dead-heading is the process of removing individual flowers or flower clusters after the blooms are spent, faded, or drooping. Removing them before they begin to seed will encourage the plant to produce more flowers. When should perennials be cut back? 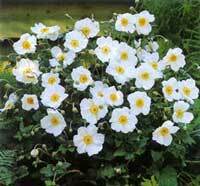 Perennials should be cut back in the fall or spring to approximately 3-4" in height.